For those who read my blog, know it has been a long time since I have posted. A few months in fact. And the unfortunate reality is that it isn’t because of my lack of time to blog. It is my lack of time to cook. Apologies to all who blog, but the latter is much more concerning. Cooking and baking is part of what makes me calm, helps me keep things in perspective, allows me to feel control when other things feel out of control. And, most importantly, it allows me to share my food with others, and therefore share my love through the gift of food. But, my busy job and travel schedule has resulted in nights of take out, frozen pizza and late night visits to our favorite local restaurants. So, this past weekend I was finally in town. No work trips. No packed social calendar. Just a weekend to enjoy fall and reset for the busy week ahead. And fall being my favorite culinary season, I knew I had to take this opportunity to get back to what I love. 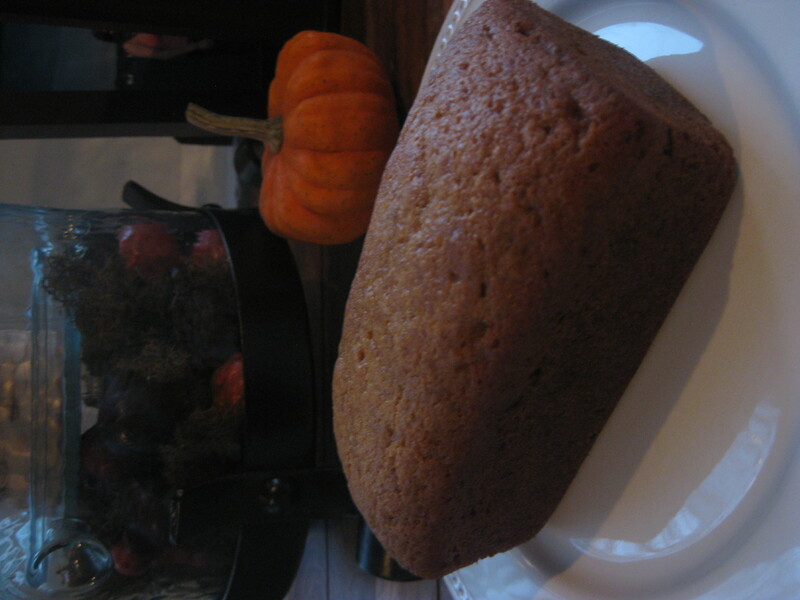 So, after 8 mini loaves of pumpkin bread that filled our house with the scents of fall, and was shared with neighbors, coworkers and friends, I rekindled what had been missing in my hectic life. Although I love my job, and feel blessed every day that I go into work, I remembered the many other things that make me who I am. I had been missing going for a run, reading the latest Bon Appetit and spending the time with my husband that we both deserve. So on Sunday, with the aroma of cozy and spicy fall filling our house, after delivering a loaf to our neighbor and packing up the others for coworkers, after making my butternut squash risotto with a glass of red wine listening to Italian music…..I knew that my life needed to shift. I needed to go back to what makes me happy, and prioritize it, no matter how hectic my life becomes. So, this pumpkin bread symbolizes my commitment to spend more time doing what I enjoy doing – and that is spreading love through food. 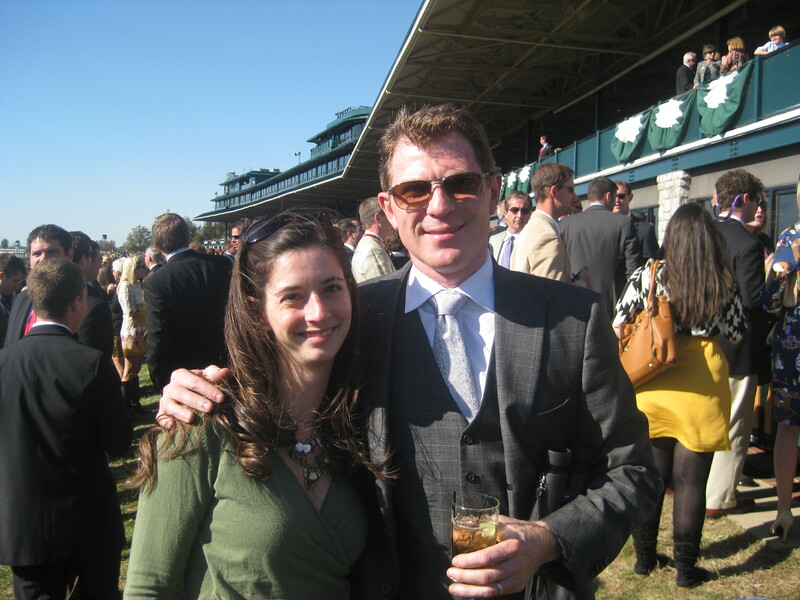 And, it was only fitting that the pumpkin bread recipe I found was that of Bobby Flay, who I surprisingly met the weekend before at Keeneland. A sign? Maybe. So besides the emotional connection I now have to Bobby Flay’s pumpkin bread, it is quite possibly the best recipe I have ever made. Granted, there is more sugar than in a batch of chocolate chip cookies, but his mixture of spices (especially All Spice, my favorite cold weather spice) make this a comforting taste of fall. So, for those who need to rekindle their love of cooking, or those just looking to make a great fall treat for the ones they love, I thank Bobby Flay for giving me the recipe that made me realize what I had been missing. 1. Preheat the oven to 350°F. Butter a 9-inch loaf pan. 2. Whisk together the flour, salt, baking soda, baking powder, cinnamon, nutmeg, allspice, and cloves in a small bowl. 3. Beat the butter, sugar, and oil on high speed in the bowl of a stand mixer fitted with the paddle attachment, scraping down the sides and bottom of the bowl a few times, until light and fluffy, about 1 minute. 4. Add the pumpkin puree and mix until combined. Add the eggs, one at a time, and mix until just incorporated. Mixing on low speed, slowly add the flour mixture and 2/3 cup water and mix until just combined. Spread the batter into the prepared pan and bake until a toothpick inserted into the center comes out clean, 1 hour to 1 hour 15 minutes (if you are using a small 4 loaf pan bake for only 45 minutes). Let cool in the pan on a wire rack for 10 minutes. Remove from the pan and let cool completely. What I love about the change in seasons, is the smells that come with it. Pine needles, stewed beef and cinnamon in the winter; fresh citrus, tulips and asparagus in the spring; searing steaks on the grill, fresh cut grass and ice cream in the summer; and last, but not least, pumpkin, musky leaves and warm spices in the fall. The seasons not only give you temperature changes and an excuse to mix up your wardrobe, but they give you an olfactory experience like none other. You can literally close your eyes, inhale, and know the month of the year. And out of all of the seasons, fall is by far my favorite. The smells make me want to rake leaves (did I really just say that? ), drink apple cider, pick apples, cook warm meals and dive into red wine season. And when the weather brings the smells of fall, my cooking shifts along with it. Alas, my seasonal culinary point of view may have “pumpkined out” my husband, who just had pumpkin whoopie pies, pumpkin beer and pumpkin pasta all within one week. So, I had to keep with my fall focus, but stray a bit from the obvious. So upon seeing a recipe with sauteed apples and fall spices, I knew this would keep me “in the fall spirit” without putting my husband on pumpkin overload. Thanks to Cooking Light for this fantastic recipe. It was quick, easy, and even could be altered to roast the tenderloin whole if you want (might do that next time!). I served it with a spinach salad with pecans, feta and a simple lemon/olive oil/cider vinaigrette. So, make this recipe, pour a glass of smooth red wine, look at the beautiful mosaic of colored trees and take a deep “sniff” of this perfect fall dinner! Heat a large cast-iron skillet over medium-high heat. Combine first 5 ingredients; sprinkle spice mixture evenly over pork. Coat pan with cooking spray. Add pork to pan; cook 3 minutes on each side or until desired degree of doneness. Remove pork from pan; keep warm. Melt butter in pan; swirl to coat. Add apple slices, 1/3 cup shallots, and 1/8 teaspoon salt; sauté 4 minutes or until apple starts to brown. Add apple cider to pan, and cook for 2 minutes or until apple is crisp-tender. Stir in thyme leaves. 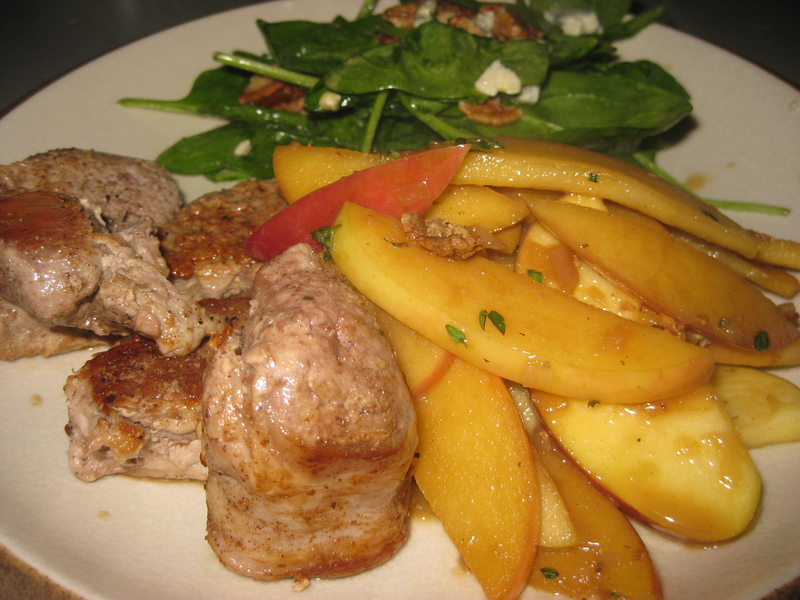 Serve apple mixture with the pork. Apparently Whoopie Pies got their name from Amish wives making them for their farmer husbands and putting them in their lunches. When they would open their lunches, they would say “whoopie!” And, for good reason. If you have ever had these small round cakes sandwiched between sugary, marshmallowy frosting, you will know what I mean. Although baking them myself? I don’t know…might be easier to go to a bakery. This technique would be doomed in my amateur kitchen – how do you make the cakes so round? How do you get the right texture? How do you assemble without breaking? But, when Bon Appetit featured a recipe that included pumpkin and maple, classic fall ingredients, I really had no choice but to give it a whirl. And worst case, my husband would shout “whoops” instead of “whoopie” and we would break out the tub of vanilla ice cream in the freezer instead. I cannot fully express the reaction my husband gave when he ate one – it wasn’t “whoopie” (after all his mouth was terribly full) but eventually was along the lines of “I can’t stop eating these!” The cake is like a pumpkin bread but sweeter, and the frosting I could just eat with a spoon. The perfect fall dessert! Now, the technique. My fears were a bit unwarranted, I must say. You truly just spoon the batter on the cookie sheet (I used my cookie scooper) and they turn into pretty round cakes (although I saw in my Sur La Table catalog they do make Whoopie Pie Pans). Bon Appetit nailed the timing – 20 minutes exactly (check with a toothpick). Then, assembly was a piece of cake (sorry, I couldn’t help it!). 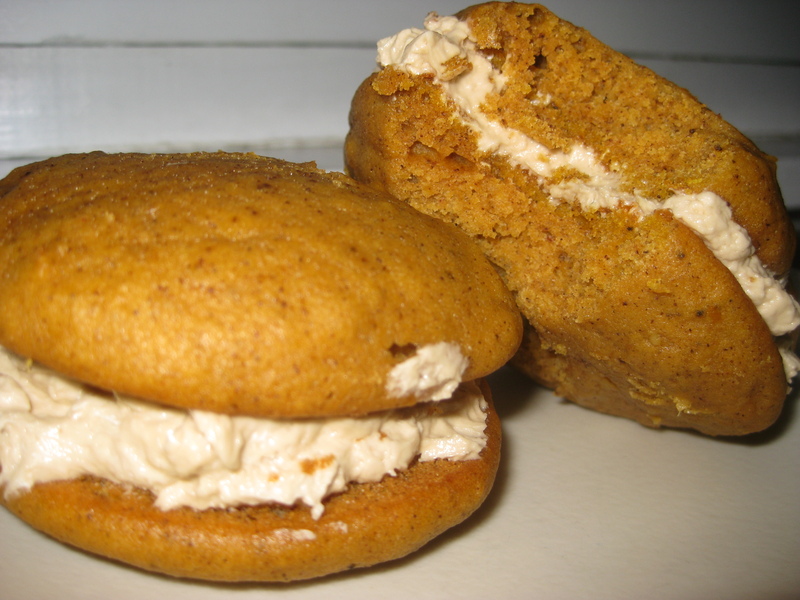 No breakage, just perfectly beautiful pumpkin whoopie pies. Using electric mixer, beat sugar and butter in large bowl until fluffy, about 2 minutes. Add marshmallow creme and maple extract; beat until blended and smooth. DO AHEAD Can be made 2 hours ahead. Let stand at room temperature. Sift first 7 ingredients into large bowl. Using electric mixer, beat butter and both sugars in another large bowl until blended. Gradually beat in oil. Add eggs 1 at a time, beating to blend between additions. Beat in pumpkin. Add dry ingredients in 2 additions alternately with milk in 1 addition, beating to blend between additions and occasionally scraping down sides of bowl. Cover and chill batter 1 hour. Arrange 1 rack in bottom third of oven and 1 rack in top third of oven; preheat to 350°F. Line 2 baking sheets with parchment; spray lightly with nonstick spray. Spoon batter onto baking sheet to form cakes (about 3 level tablespoons each; about 12 per baking sheet), spacing apart. Let stand 10 minutes. Bake cakes until tester inserted into centers comes out clean, about 20 minutes, rotating sheets halfway through baking. Cool cakes completely on baking sheets on rack. Using metal spatula, remove cakes from parchment. Line cooled baking sheets with clean parchment; spray with nonstick spray, and repeat baking with remaining batter. Spoon about 2 tablespoons filling on flat side of 1 cake. Top with another cake, flat side down. Repeat with remaining cakes and filling. DO AHEAD Can be made 8 hours ahead. Store in single layer in airtight container at room temperature. I will admit, I don’t make breakfast much. It isn’t that I don’t like it, or don’t have time – it just always seems on the weekends after sleeping in, we would rather just relax with a bagel and coffee in our sunroom or go to our favorite local coffee shop or diner. But, last weekend my husband biked 150 miles for MS over two days, and after day 2, I wanted to feed him a huge feast for brunch. I have always wanted to try an overnight french toast, especially because if it was good, it would be the perfect recipe for company (since it doesn’t include spending time in the kitchen making to order). This particular recipe came from the cookbook Blend It! from Good Housekeeping. It is a great book of dips, smoothies, baked goods and drinks all using your handy blender. Not only did this taste fantastic (almost like dessert!) but it looked beautiful, especially with fresh fruit on top. Word of advice, don’t panic when you look at the bread in the oven and it looks like it is going to pop out of your glass dish and take over your kitchen – when you take it out and it starts to cool, the whole things puffs back down. Thanks again to Good Housekeeping for this great brunch recipe! Arrange bread slices in four stacks in 8-inch square baking dish. In blender, combine eggs, milk, vanilla, cinnamon, nutmeg and salt and blend until mixture is smooth. Slowly pour egg mixture over bread slices; press bread down to absorb egg mixture over any uncoated bread. Cover and refrigerate overnight. Preheat oven to 350 degrees. In small bowl, stir brown sugar, butter and maple syrup until combined. Spread evenly over each stack of bread. Bake until knife inserted 1 inch from center comes out clean, about 1 hour. Let stand 15 minutes before serving. 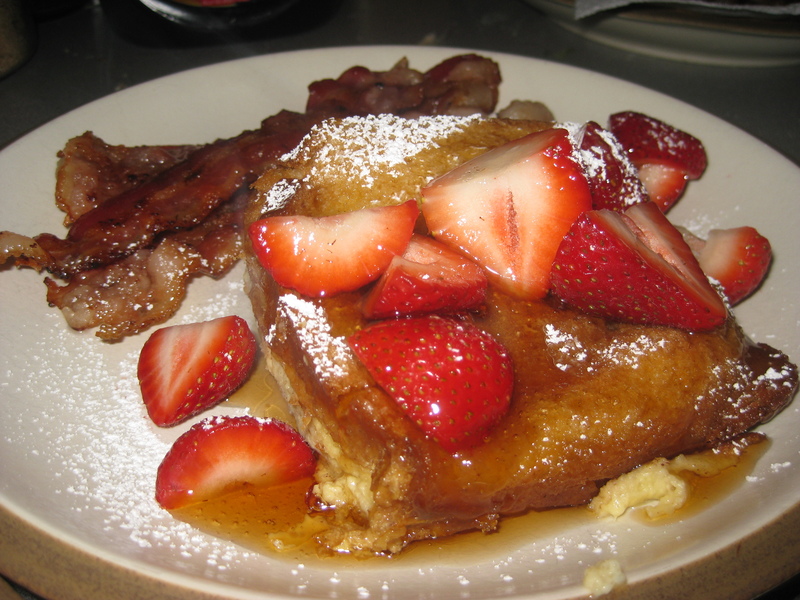 Serve with fresh fruit and additional syrup (if desired). Sift with powdered sugar. Although I normally make this dish for Thanksgiving, I made it for Easter this year to take to a friend’s house for a big family Easter Dinner (thanks Tim and Julie!). It travels well, is easy to make, and is always a crowd favorite. And – it transforms people’s views of sweet potato casserole if they are used to the super sweet versions with marshmallow topping. I first tried this one a while ago to bring up to Michigan for Thanksgiving, and have been making it ever since. The recipe originally came from Food Network, but was adapted from reviews from others and my own additions. The result is a tried and true favorite that is made frequently in our house. And, a testament to how easy it was – I made the dish during a 5-day stint of watching my adorable nephews (18 month old and 6 year old). I actually cooked and mashed the potatoes the night before during a break in the action, then put the rest together during the little one’s nap the next day. The whole dish takes time (an hour or so to cook the potatoes then another hour to put it together and bake) but not much hands-on time, which I love. And, to those at Easter Dinner who asked for the recipe – here it is! Sorry for the sad looking picture, but it conveys how people were digging into it before I had gotten my camera out! My 18-month old nephew/godson even ate a few monster helpings (although a photo of him with orange mush all over his face and hands wouldn’t have been as appealing). Turn the oven down to 350 degrees F. Scoop the sweet potato out of their skins and into a medium bowl. Discard the skins. Mash the potatoes until smooth. Add the eggs, butter, brown sugar, salt, cinnamon, ginger, nutmeg, and pepper to taste. Whisk the mixture until smooth. Butter an 8 by 8-inch casserole. 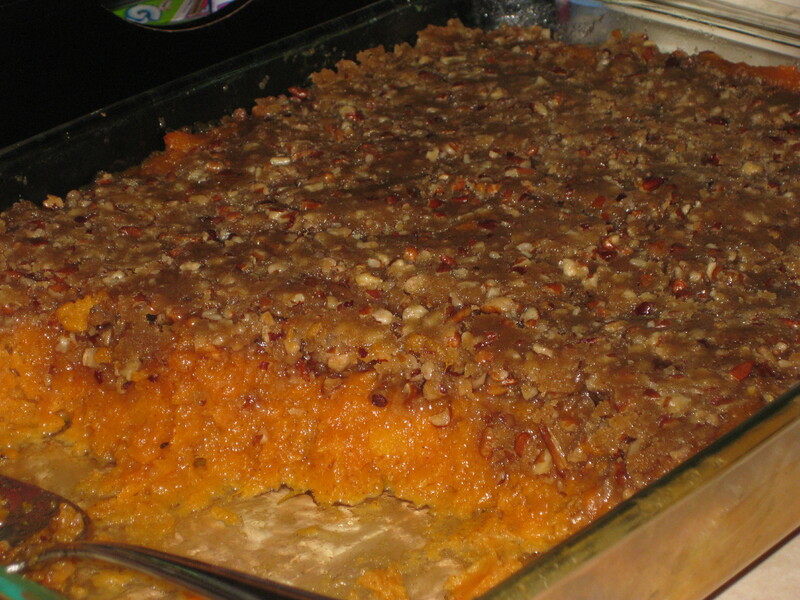 Pour the sweet potato mixture into the pan and sprinkle the top with the pecan topping mixture. Bake for 30 to 40 minutes until a bit puffy. Serve immediately. Yes, this is the second pumpkin recipe I am blogging about in two days. But for those who know me, know I live by seasonal cooking. So, being mid-October, you will be seeing lots of pumpkin, butternut squash and my transition from grilling to comfort food. This recipe is a favorite in our house. The pumpkin with nutmeg and cozy spices make it a comforting dish – and the sausage give it an extra kick of flavor. This recipe originally comes from Rachael Ray. If you are ever looking for an alternative to the traditional pumpkin pie, this recipe will do the trick. I will admit, I was a bit skeptical putting yellow cake mix as a crust (made just with butter and eggs to be a chewy, condensed version). But, it really works, and gives it a substantial crust to hold the pumpkin goodness. I will warn you – they are sweet (yes, there is a whole box of powdered sugar! ), so a small piece will be plenty. But, they are a regular seasonal favorite in our house -made every Thanksgiving and many times before. Paula Deen gets the credit for this one.